WASHINGTON (Feb. 26, 2016) -- As the Army draws down to 490K Soldiers, many will be looking for civilian careers, and Sgt. Maj. of the Army Daniel A. Dailey said the service has "invested heavily" in ensuring they are successful. On Capitol Hill, Feb. 26, Dailey met with lawmakers of the House Appropriations Committee, subcommittee on military construction, veterans affairs and related agencies, to discuss quality of life issues. One reoccurring topic of discussion was credentialing for Soldiers. Sgt. Maj. of the Army Daniel A. Dailey, left, talks with Master Chief Petty Officer of the Navy Mike D. Stevens, center, Sgt. Maj. of the Marine Corps Sgt. Maj. Ronald L. Green, right, and Chief Master Sgt. of the Air Force James A. Cody (back to camera) in advance of a Feb. 26, 2016, testimony on Capitol Hill before the House Appropriations Committee, subcommittee on military construction, veterans affairs and related agencies. 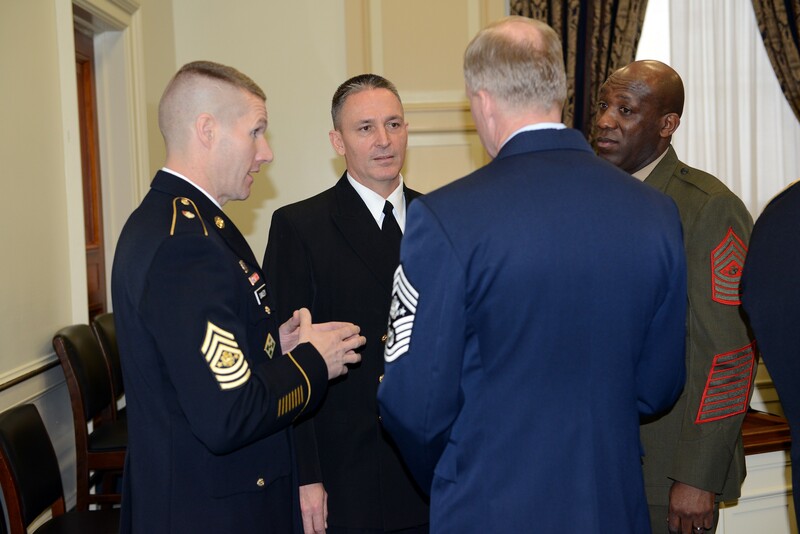 The four senior enlisted advisors discussed quality of life issues. When a Soldier drives a truck in the Army, or has been trained as an electrician, for instance, that Soldier may want to eventually take those skills out of uniform and into the private-sector workforce. Often that requires some form of credentialing in the state he or she hopes to live in. Lawmakers were interested in what could be done to make that credentialing process easier for Soldiers -- as credentialing requirements vary from state to state, and also cost money. "This is something the Army has invested heavily in over the past several years," Dailey told lawmakers. "We have made great strides. The Army has become 88 percent compliant with the VOW Act in the last three years, and we have had great help through Congress." The Army has made great strides with regards to credentialing, Dailey said, adding that it is helping communities recognize the value of military experience. The Army has already credentialed over 30,000 Soldiers with the help of Congress, Dailey said. But more could be done. Tuition assistance, he said, might be used to help Soldiers get access to credentials, for instance. That would make the skills they learned in the Army more valuable in the private sector. Dailey said so far he's seen "great improvement" in the efforts to prepare Soldiers for civilian employment. Between 2012 and 2015, "the Army alone has reduced its non-employment compensation from over $512 million to $250 million," he said. "We have to open our aperture on things like tuition assistance, and allow our young men and women who deserve those credentials -- the great skills that they hone while they are Soldiers, Sailors, and Airmen and Marines can be added upon with these credentials, and they will be more valued ... when they become Soldiers for Life in the future." Dailey said such an investment would be small. Credentials, he said, cost anywhere from $150 to $500. "There is no reason we can't invest in them," he said. "We have proven that investing in them now is a great investment for us in the future." Regular Army Soldiers typically live on or near a military installation -- a nexus of services for uniformed personnel. But Army National Guard and Army Reserve Soldiers don't always live near a military installation, Dailey said. For them, accessing the resources provided to Regular Army Soldiers -- things like mental health services, for instance -- is more difficult. Sgt. 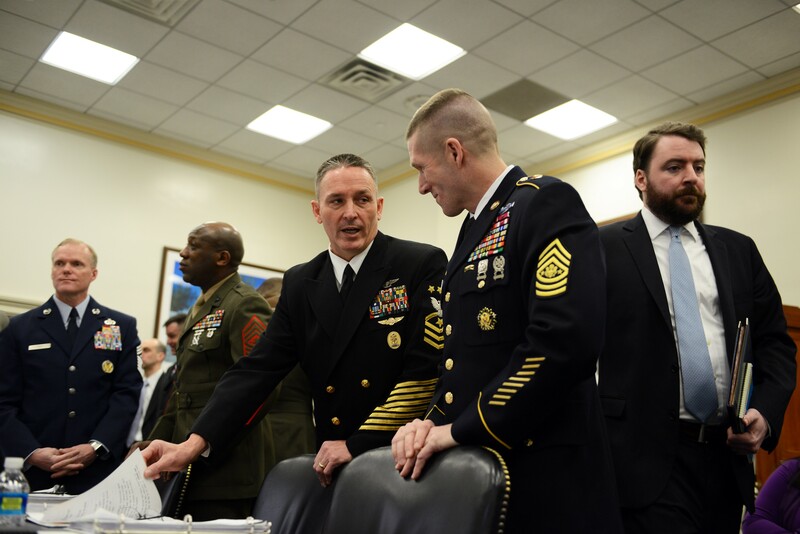 Maj. of the Army Daniel A. Dailey, right, speaks with Master Chief Petty Officer of the Navy Mike D. Stevens, left, in advance of a Feb. 26, 2016, testimony on Capitol Hill before the House Appropriations Committee, subcommittee on military construction, veterans affairs and related agencies. The two, along with Sergeant Major of the Marine Corps Sgt. Maj. Ronald L. Green and Chief Master Sergeant of the Air Force James A. Cody discussed quality of life issues. The Army's been trying to stem suicides among Soldiers for years now -- and has made great strides in that effort. But this year, Dailey said, the Army has seen an increase in suicides. "This year was a tough year for the U.S. Army," he said. "We actually saw an increase in suicides and some of that was in our Guard and Reserves." "We can do more," Daily said. "And where you can help us is getting that help out to the National Guard and Reserves. They are dispersed throughout the U.S."
Dailey also outlined top Army priorities for lawmakers. The first of those is readiness, he said -- as it is for Chief of Staff of the Army Gen. Mark A. Milley. "As we draw our Army to historic lows ... readiness will always be our No. 1 concern," he said. "That's where we need to focus our attention. We do need predictable resources to make sure our Soldiers are prepared to do the mission we ask them to do." Also a priority: the future of the Army. "We have to look beyond the next few years, and look out many years," Dailey said. "We have potential adversaries out there we need to maintain focus on. The future of the force requires consistent and reliable resourcing to make sure we stay well above the pace of our adversaries." A third priority he said is Soldiers and their families. "They are our Army," he said. "It's not just Soldiers, but Families and great Civilian leaders. And they trust us that we will maintain pace with the resourcing we need to be able to make sure they can take care of their families while our Soldiers are doing the things we ask them to do." "Our Soldiers are not asking for much," Dailey added. "We just need to be able to find them the necessary resources they need to accomplish their mission."